Sign up and receive Property Email Alerts of Houses for sale in Baronetcy Estate, Parow. 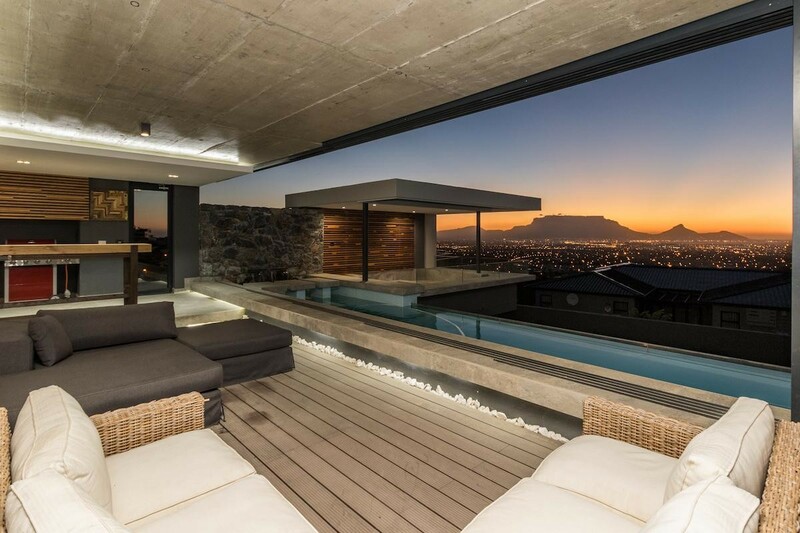 This 800sqm sophisticated, stylish, sensational home that's both functional and exciting is built on different levels with 180 degrees views over Platterkloof, Table Mountain and the sea. Positioned on a 1000sqm stand high above the estate. It's a balance of granite, solid wood, glass and metal. The grand double volume entrance drops down into the living area with amazing fully equipped open-plan kitchen (SMEG gas hob and oven) with large scullery, laundry, dining room and lounge with gas fireplace. This space opens onto an expansive balcony with wood sliding blinds, barbeque area, bar, swimming pool, and jacuzzi with an amazing sundowner veranda. All spaces have breathtaking views. There is also a private attached en-suite flat-let with small kitchenette and private balcony for guests, teenager or parents. Garden stairs lead you down into the established garden. Upstairs - 4 Bedrooms all en-suite with balcony access. The main bedroom boasts HIS & HERS dressing room, wet bar, large bathroom with walk-in shower and modern bath with views of Table Mountain. Two levels down - Guest cloakroom, wine cellar, fully equipped cinema / media room with a guest cloakroom and en-suite staff accommodation. 4 Garages and parking for at least 6 cars. Extras - Air-conditioning in all the bedrooms and living area, music thoroughout the house and lighting that embraces different moods. Looking for peaceful, grand living in the most secure upmarket estate in Cape Town with easy access onto the N1, and close to shopping centres, schools, hospitals. Sign-up and receive Property Email Alerts of Houses for sale in Baronetcy Estate, Parow.